Here's a great old Enamel on Metal pump plate sign, most likely from the 1960's or early 1970's. It reads "FOR USE AS A MOTOR FUEL ONLY - CONTAINS LEAD - (TETRAETHYL)". 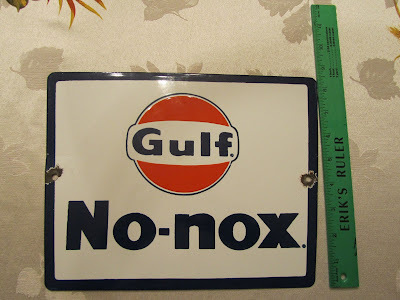 It measures 7 inches wide by 6 inches high and the enamel remains smooth throughout - it's in great shape for something meant to be installed on an outdoor gas pump. This sign is now SOLD! We just sold this Ozzie Smith autographed Gateway Cachet on eBay! More great sports memorabilia items coming soon! I have quite a number of other Gateway Cachets in stock, including several rare ones featuring players like Charlie Gehringer and Bill Dickey, and all in top condition, so let us know if there is a specific one you're looking for! Here's another great old advertising sign we recently sold on eBay, a 50- to 60-year-old Crystal Spring Beverages sign. We LOVE these old advertising signs! More are coming soon, EXCLUSIVELY to lovequistantiques.com! 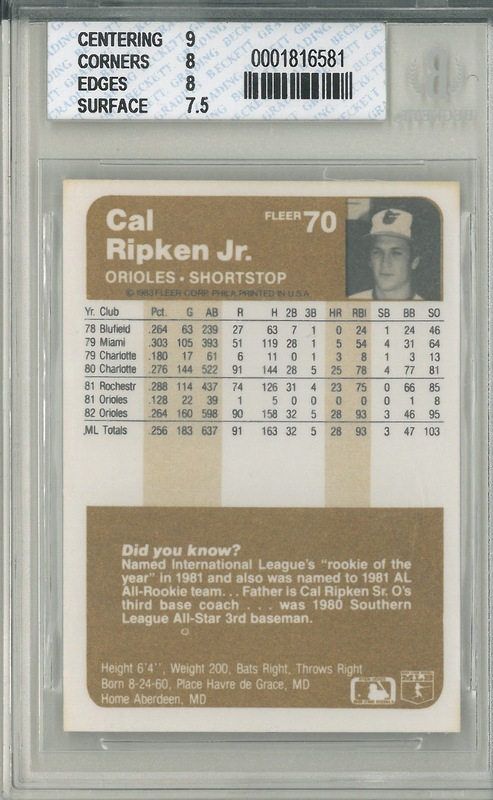 We've LOWERED the price on TWO great Cal Ripken, Jr. cards! Here are a couple of great old Cal Ripken, Jr. baseball cards! 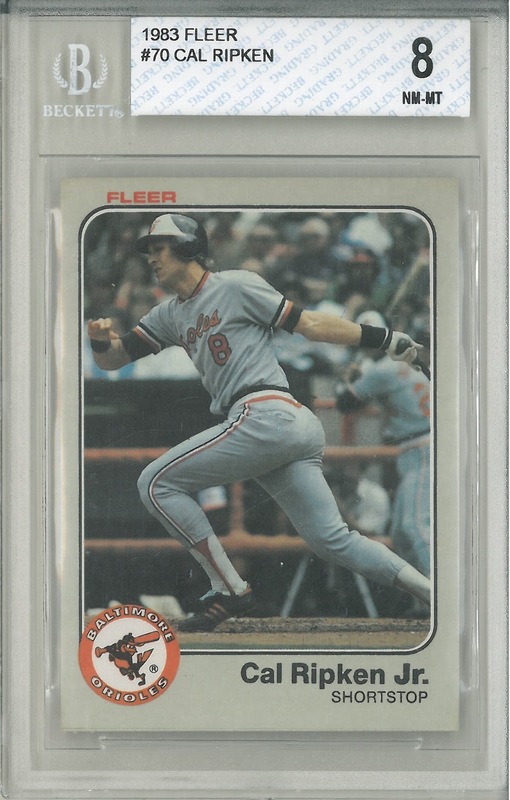 The top card is an ungraded 1982 Fleer Cal Ripken, Jr. rookie card #176 in Near Mint condition and encased in a screw-down. In my opinion, based on over 20 years of sports card collecting, it would likely grade between an 8 and 9 on corners, edges, and surface, and a 7 on centering. 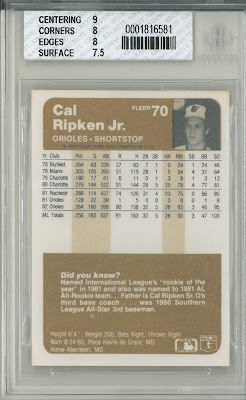 The bottom card is a 1983 Fleer Cal Ripken, Jr. #70 that has been graded a NM-MT 8 by the Beckett Grading Service. It got a 9 for centering, 8's for both edges and corners, and a 7.5 for surface. We are now offering both cards together for one amazingly low price! For just $13, you'll get both cards of this Baltimore Orioles Hall Of Famer shipped to your home in a well-padded envelope. That's less than half the book value of just the Ripken rookie! Email us at lovequistantiques (at) outlook.com and add these two great cards to your collection! Up for grabs today is a great old tin Job Cigarette Papers sign from the early part of the 20th century. It reads "Papier JOB a Cigarettes". The letters and border are off-white and embossed. The background is a very dark blue. The reverse is dark green. 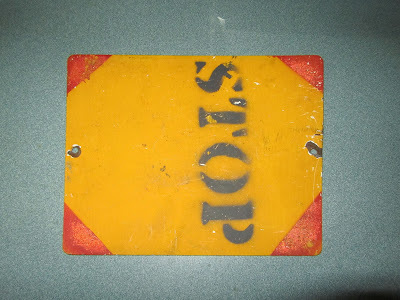 It is made of tin, but it is thicker and more rigid than many tin signs (it's almost like a large license plate). It measures 13 1/2 inches wide by 6 3/8 inches tall. It was manufactured by the Metalgraf company of Milan, Italy (Milano). Metalgraf was only in existence from about 1910 until 1930, so this sign must date from that period, and I am guessing that the numbers "5612" after the maker's name and location may be a date code indicating that it was made in 1912, meaning that it is 100 years old! This sign is by no means mint, as it has numerous scuffs and scrapes and the dings of age, but it is nevertheless in excellent shape for something this old, and may very well be the finest extant example of this particular sign - I can't find a better one! The dark blue color definitely makes an impact! Please peruse the pictures for the full story. We are asking just $60 for this wonderful old tin sign, and that price INCLUDES shipping via USPS Priority Mail! Contact us at lovequistantiques (at) outlook.com if you want it! Here's another great item we JUST SOLD! This White Mountain icebox dates from the early part of the 1900's, probably right around 1910, and definitely pre-WW1. It stands about 41 inches high, 29 1/2 inches wide, and 18 1/2 inches deep. It is all original, from the hardware and brasses to the hinges, and even has the original distributor's label inside (which is an exceedingly rare find). It is in very fine condition and could still be used - in fact, there is even a resort near Lake Winnipesaukee that maintains its own icehouse and still uses these exact iceboxes in their cabins! 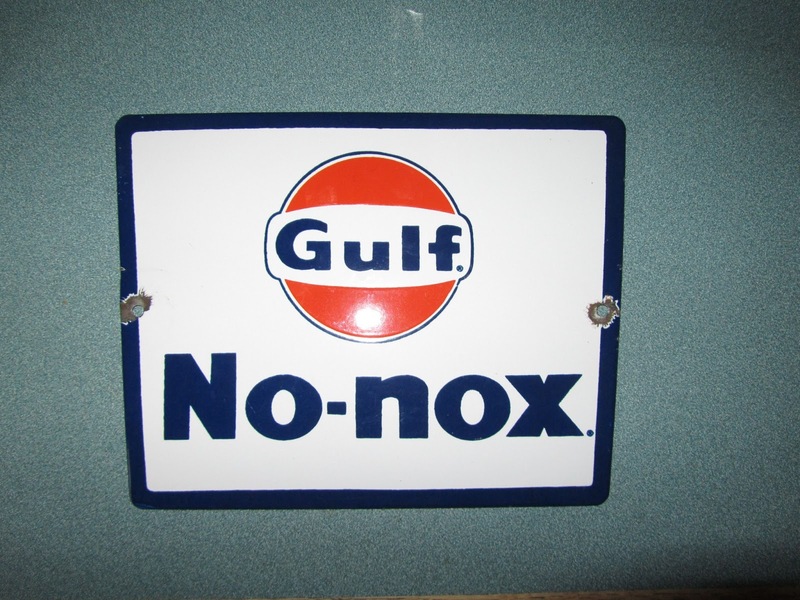 Check out this terrific Gulf No-Nox Pump Plate Sign! Here's an item you will ONLY see for sale here! It's an original 1950's Enamel on Metal pump plate sign for Gulf No-Nox Gasoline. The front is in excellent shape, and the enamel remains smooth and bright. The reverse, normally dark gray or black in color, has been painted on, which doesn't really affect the value, as one would not be displaying the back of the pump plate anyways. There is a slight bend near the hanging hole on the left side, but it does not affect the beauty or hangability of this great sign. We are asking $115 for this beauty, which INCLUDES USPS Priority Mail shipping anywhere in the United States. Sorry, international shipping is not available. BONUS: You can buy both this item and the "Contains Lead" porcelain sign above for just $135 and we'll ship both for FREE via USPS Priority Mail! If you want it, please email us at lovequistantiques (at) outlook (dot) com. We accept PayPal, and would be willing to accept checks, cash, or money orders as well, so please contact us for details! Thanks for looking! Welcome to our blog! More info coming soon!